Ten tips to successfully brew your own kombucha. With the days and nights getting colder around these parts, we are all looking for ways to keep healthy and prevent illness. You may have heard about kombucha or come across it in health food stores, but how much do you know about this trendy health drink, and can you follow these 10 steps to successfully brew your own kombucha at home? Kombucha is a refreshing sparkling drink produced by providing a SCOBY – acronym for Symbiotic Culture Of Bacteria and Yeast – with tea and sugar for a few days to weeks. The resulting fermented kombucha is harvested by filtering the brewing liquid. It can be drunk after having rested for 2 days at room temperature for increased fizziness, or put in the fridge straight away. Although it tastes delicious as it is, it can be flavoured with ginger, fruit, spices, and combined with spirits to make cocktails. Kombucha contains acetic acid (the same compound found in vinegar), B vitamins, amino acids, as well as beneficial bacteria and yeasts. Its health benefits are not scientifically proven, but it can be drunk as a source of probiotics and B vitamins. 1. Start on the right footing. 2. Clean up your act. Be scrupulously hygienic when you are setting up and whenever checking your SCOBY to avoid cross-contamination: wash and rinse your hands thoroughly with plenty of water (no soap residues, SCOBYs do not like it! ), and dry your hands with paper towels; sterilise any containers and utensils with boiling hot water for 30 seconds before leaving to air dry and cool down; brew your kombucha in a room free of spores and moulds. 3. Your SCOBY needs tlc. Always handle your SCOBY gently. Never use metal or metal-containing recipients and utensils (sieves, spoons, funnels…). Some ceramic glazes can leach lead, which can be toxic. Use food-grade plastic or glass around your SCOBY. 4. Your SCOBY likes it cozy. 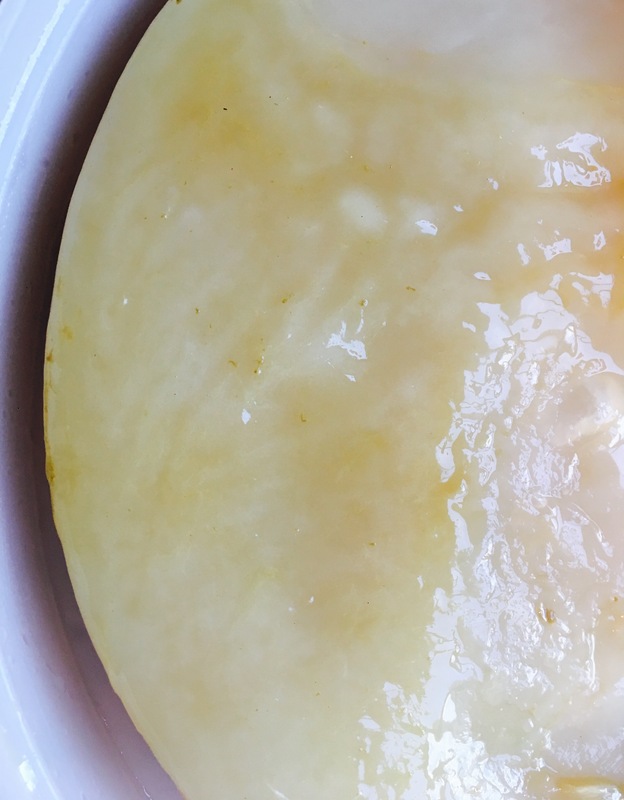 Never put your SCOBY in the fridge or in direct sunlight. Keep it at a comfortable room temperature (21-23 degrees). Never top up the brewing liquid with hot/warm tea. Allow the tea to cool down to lower than hand temperature before adding. 5. Your SCOBY has a sweet tooth. Your brewing liquid should be a mixture of black or green tea and sugar. Sugar is what your SCOBY eats, so don’t use less than 80 grams of sugar per litre, as this will not be sufficient to feed the SCOBY, and other non-beneficial bacteria and moulds might proliferate. If you see mould on your SCOBY, it’s game over. Put it on the compost along with all the brewing liquid, and start over with a new SCOBY. 6. Your SCOBY needs protection. 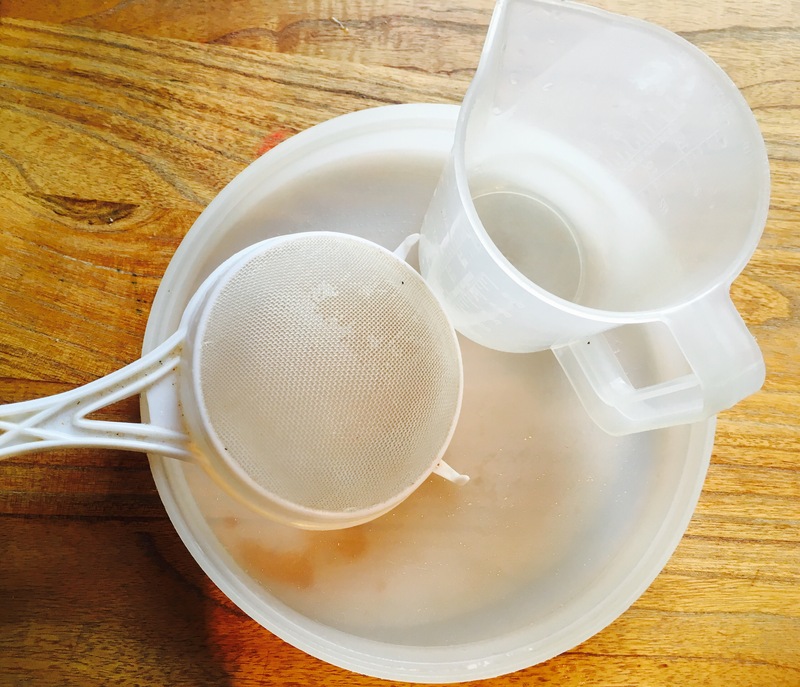 Cover the brewing container with a clean cotton tea towel secured with a rubber band to avoid flying insects falling in and any risk of contamination. 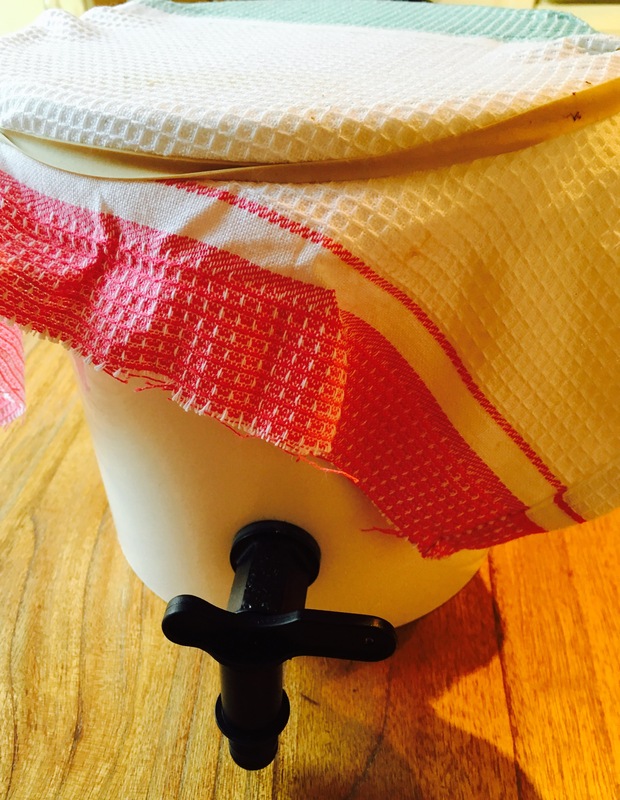 Do not cover with a tight lid, the tea towel allows the SCOBY to breathe. And keep that tea towel clean by washing it regularly. 7. Leave some for your SCOBY. When harvesting your kombucha, always keep at least 2 cups (1/2 litre) of brewing liquid for the next brewing batch. This should smell of vinegar and be a clear yellow liquid. 8. Keep an eye out for explosions. If you’re brewing from a starter culture, the kombucha should be ready to harvest in about 2 weeks, depending on room temperature and conditions. You can keep trying it with a straw, it should taste a little sour and fruity, similar to apple cider vinegar, and not at all like sweet tea. Filter the liquid into a bottle with a cap. The resulting drink can be left to ferment for up to 2 days at room temperature before refrigerating for up to 6 weeks. During this process, there is a danger of bottles becoming overfilled with gas, so you will need to keep checking to allow excess pressure to escape. The fermentation process will increase the level of alcohol which should stay below 0.5%. 9. Kombucha is a live culture. Respect Nature. Kombucha, when brewed properly, contains beneficial bacteria and yeast, and so do healthy gastrointestinal contents. Our gut microflora is part of a carefully regulated and relatively fragile ecosystem. To enjoy the probiotic benefits of kombucha, a few precautions must be taken when drinking for the first time: for the first week, only drink half a cupful once a day in the morning before breakfast. The second week, a cupful can be drunk once daily at any time of day. And after that, you will be ready to enjoy a few cups at any time of day. 10. Kombucha is not for all. Kombucha is not suitable for everyone to drink: diabetics, immune suppressed people and pregnant women should not consume kombucha regularly. Be aware that as for all home-brewed products, kombucha made at home is not pasteurised. Strands can form in the drink, which are harmless, but can be filtered out. Although there are potential risks associated with consuming unpasteurised drinks, keeping the conditions optimal by following the guidance above should prevent any problems. – use a wide brewing jar (the neck should be at least as wide as you hand): the larger the surface area your SCOBY has, the faster the fermentation process. – recycle your screwcap bottles to bottle up your brewed kombucha. – use fair trade cane sugar (golden caster is what I use) and avoid refined white sugar where possible. – I use the following recipe for my kombucha brewing tea: 3 tea bags of Clipper organic green tea, 90g golden caster sugar, 1 litre of just boiled water; I brew the tea for 30 minutes, after which I add the sugar, mix well and then leave to cool. I use this mix every 5 days to replace one litre of harvested kombucha. I can harvest up to 3 litres from my mix (I got a 5 litre brewing kit), but I would need to wait longer for the next batch. 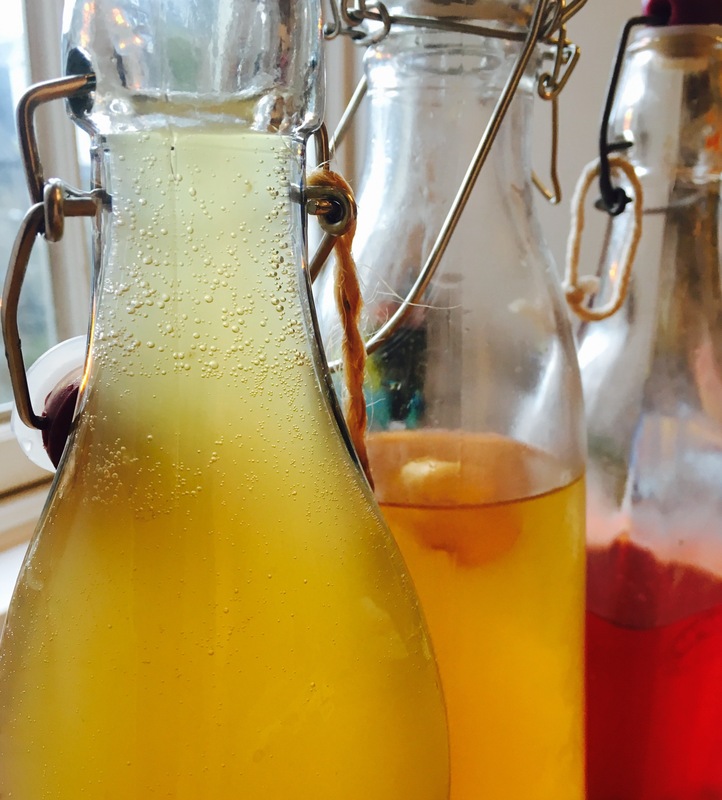 – once bottled you can add your own flavours to the kombucha. Try blueberries and cardamom, or fresh ginger, so delicious! 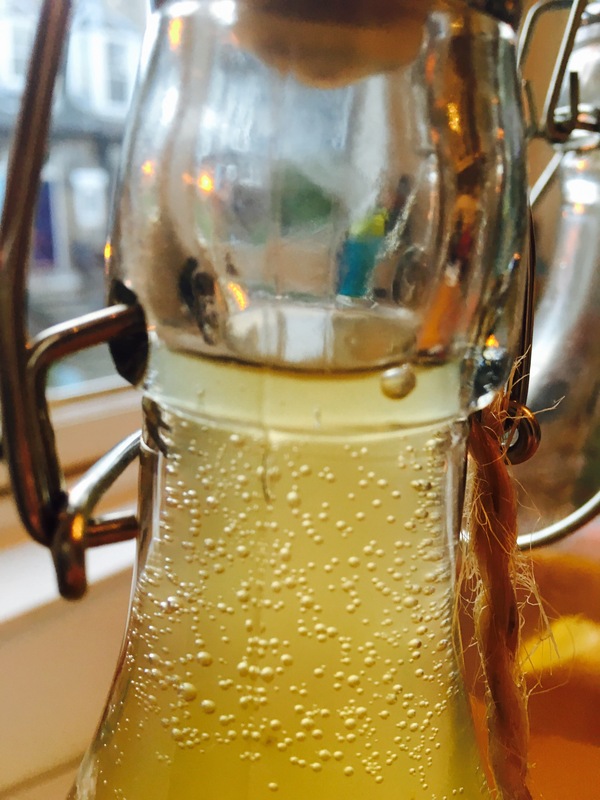 I will be posting scrumptious kombucha creations on this blog regularly, so click on the Follow button up there so you don’t miss out. -variations on the above recipe can be found in the wonderful book Kombucha Revolution, to which I have no affiliation and nothing but gratitude. – share your SCOBY babies and knowledge with your pals and strangers alike to spread the kombucha love. In Edinburgh, check out the free Facebook share pages (Meadows Share,…), or places like the SHRUB or the Forest Cafe. If you would like a free SCOBY to start your own kombucha brewing, drop me a message via the Contact page, and I will sort you out, depending on availability.